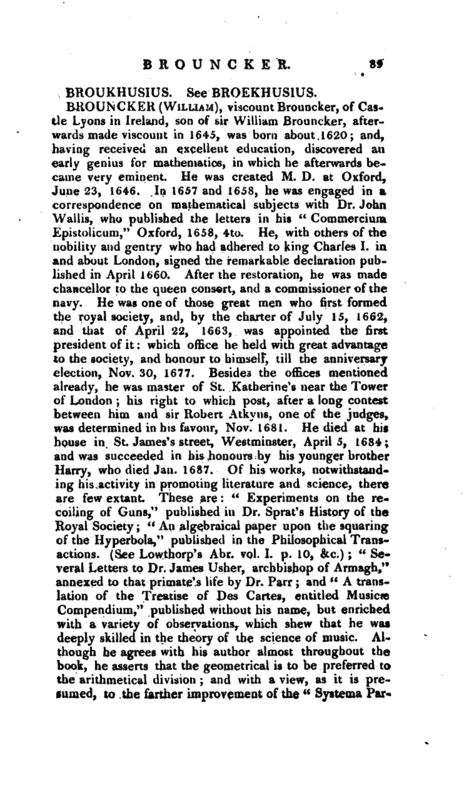 , a learned divine, and one of the original writers of the Biographia Britannica, was born at London, July 5, 1704, in the parish of St. Andrew, Holborn; of which parish his father was minister. At an early age he was sent to Eton-school, where he soon distinguished himself by the acuteness of his genius and the studiousness of his disposition. Being superannuated on this foundation, he removed, about 1722, to the | university of Cambridge; and, for the sake of a scholarship, entered himself of Gonville and Caius college. Here two of the principal objects of his attention were, the acquisition of the knowledge of the modern languages, and the study of the mathematics under the famous professor Sanderson. 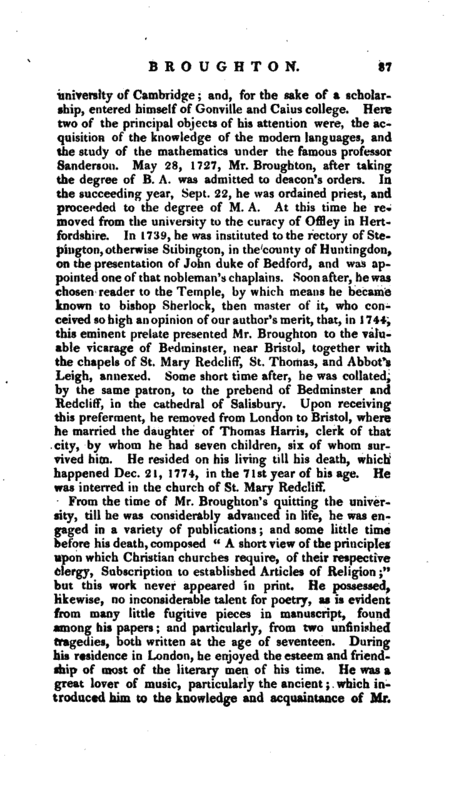 May 28, 1727, Mr. Broughton, after taking the degree of B. A. was admitted to deacon’s orders. In the succeeding year, Sept. 22, he was ordained priest, and proceeded to the degree of M. A. At this time he removed from the university to the curacy of Offley in Hertfordshire. In 1739, he was instituted to the rectory of Stepington, otherwise Stibmgton, in the county of Huntingdon, on the presentation of John duke of Bedford, and was appointed one of that nobleman’s chaplains. Soon after, he was chosen reader to the Temple, by which means he became known to bishop Sherlock, then master of it, who conceived so high an opinion of our author’s merit, that, in 1744, this eminent prelate presented Mr. Broughton to the valuable vicarage of Bedminster, near Bristol, together with the chapels of St. Mary Redcliff, St. Thomas, and Abbot’s Leigh, annexed. Some short time after, he was collated, by the same patron, to the prebend of Bedminster and Redcliff, in the cathedral of Salisbury. Upon receiving this preferment, he removed from London to Bristol, where he married the daughter of Thomas Harris, clerk of that city, by whom he had seven children, six of whom survived him. He resided on his living till his death, which happened Dec. 21, 1774, in the 71st year of his age. He was interred in the church of St. Mary RedclifF. 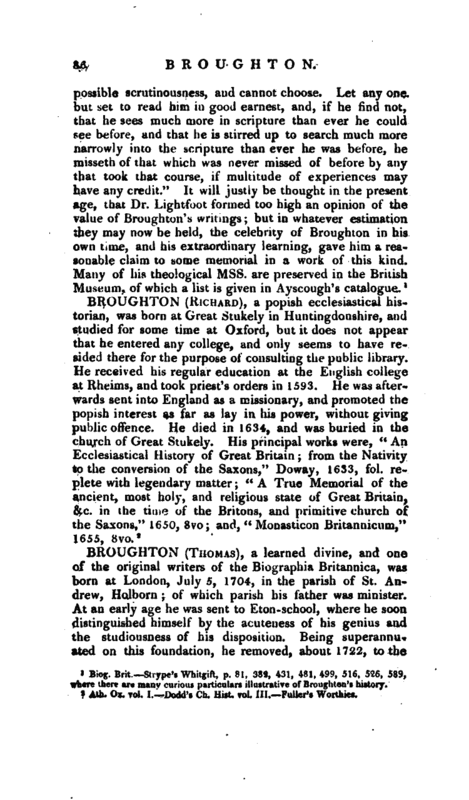 From the time of Mr. Broughton’s quitting the university, till he was considerably advanced in life, he was engaged in a variety of publications; and some little time before his death, composed “A short view of the principles upon which Christian churches require, of their respective clergy, Subscription to established Articles of Religion;” but this work never appeared in print. He possessed, likewise, no inconsiderable talent for poetry, as is evident from many little fugitive pieces in manuscript, found among his papers; and particularly, from two unfinished tragedies, both written at the age of seventeen. During his residence in London, he enjoyed the esteem and friendship of most of the literary men of his time. He was a great lover of music, particularly the ancient; which introduced him to the knowledge and acquaintance of Mr. | Handel, whom he furnished with the words for many of his compositions. In his public character, Mr. Brougbton was distinguished by an active zeal for the Christian cause, joined with moderation. In private life, he was devoted to the interests and happiness of his family; and was of a mild, cheerful, and liberal temper. This disposition, which is not always united with eminent literary abilities, attended him "to his grave. 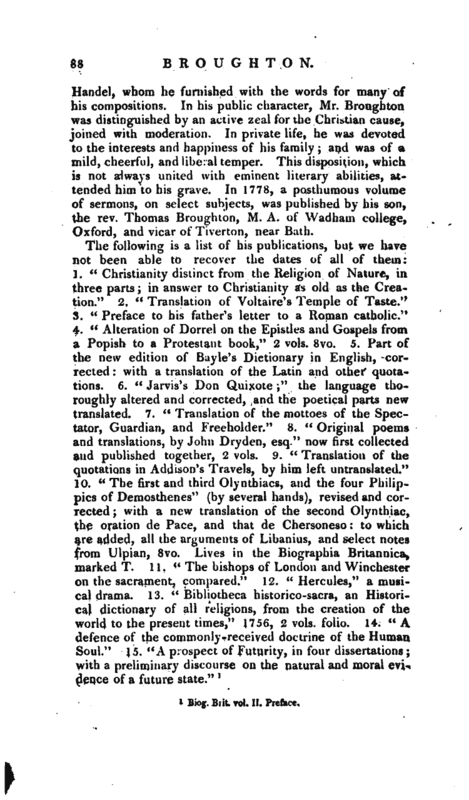 In 1778, a posthumous volume of sermons, on select subjects, was published by his son, the rev. Thomas Broughton, M. A. of Wadham college, Oxford, and vicar of Tiverton, near Bath. Biog. Brit. vol. II. Preface.